(Photo: Holy See)Pope Francis poses with St. Peter's Cricket team at the Vatican before the players left for a tour of England on September 12 at which the highlight will be a match against the Archbishop of Canterbury's XI in a Catholic-Anglican match in aid of a joint anti human trafficking charity. When India hosts a cricket international match at Eden Gardens in Kolkata and Australia does the same at the Melbourne Cricket Ground the grounds can draw more than 100,000 spectators. When a Vatican cricket team challenges the Church of England in a match at the picturesque Kent County Cricket Club in Canterbury on Friday, the organizers are expecting a smaller crowd. "Realistically, we are rank underdogs with a very outside chance, but that's okay," said the Rev. Eamonn O'Higgins, spiritual director and manager of the Vatican club in remarks carried by the Holy See's website. "What we hope for, above all, is a good match. On paper, the Anglican XI has much greater experience and match practice as individuals. "That is not surprising in England, the home of cricket. We are a competent side, nothing more. None of the Vatican XI has played first class cricket." The only Englishman in the Vatican side is Father Tony Currer, who is the captain. The rest of his team is made up of seven Indians, two Sri Lankans and one Pakistani, aged between 24 and 41. Most of the Vatican team are training for the priesthood at the Maria Mater Ecclesiae college in Rome. Canterbury is the seat of the Archbishop of Canterbury, Justin Welby, who is the spiritual head of the Church of England and the most senior bishop in the 88-million strong Anglican Communion. The match will raise funds for the Global Freedom Network, the joint Anglican-Roman Catholic anti-trafficking initiative launched in March. The St. Peter's XI will represent the Catholics when they take on the Archbishop of Canterbury's XI in their charity match to which entry is free. But there will be a collection after play has ended. Those who think of cricket being a five day affair will be relieved that the match is in the Twenty20 match format which is faster than a baseball game and takes about the same time. Pope Francis met in the Vatican on September 9 with members of St Peter's Cricket Club who were preparing for their Light of Faith Tour. The Vatican club was set up in 2013 under the auspices of the Pontifical Council for Culture. 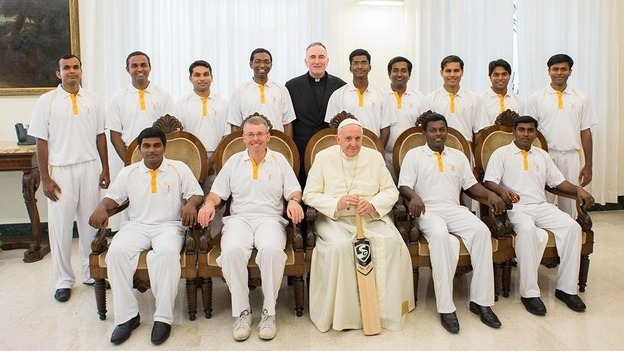 After greeting the players and signing a cricket bat for them, Pope Francis blessed the team and wished them well for this first tour which aims to forge deeper relations between young Anglican and Catholic men in training for the priesthood. St. Peter's team captain Father Tony Currer also heads the desk for relations with Anglicans and Methodists at the Pontifical Council for Promoting Christian Unity. Meanwhile the Anglican Archbishop's XI has experienced a serious setback after its captain, the Rev. Jez Barnes, announced that a back injury made it "90 per cent certain" he would not be able to play. The captaincy has been transferred to the Rev, Steve Gray, School Chaplain at Bradfield College, the Church Times reported. Barnes's place in the team has gone to the Rev. Chris Lee. Aged 31, Lee served as a missionary in Tanzania before studying at Ridley Hall for ordination. He is now an Assistant Curate at Holy Trinity, Brompton, and works at St Augustine's, South Kensington.